Help Us Build a Dream School !!! In a rural village of a small town called Karupadanna in the state of Kerala sits J&J English Medium School. It is a co-ed secondary school that serves 500 students. It’s been on that same corner for 21 years offering an opportunity for the poorest students of Karupadanna to receive an education. The school is led by Mr.Veeran P Syed, a man with a golden heart and an unparalleled commitment to education. Despite all the challenges that came across his way, he is one of the most optimistic people I’ve ever met. He spends his most of the time in this school and is constantly trying to improve his school. The school has a wonderful management who spends their own money to take students on field trips and who gives out storybooks to the top performers on their exams. Mr.Veeran on his own, without any funding from external source made a swimming pool in his school and let his students use it without any additional fees. Also he made it compulsory for the students from Grade 3 to learn swimming for an hour a week. The teachers here deal with irregular student attendance, lack of teaching resources, and are faced with classrooms that have drastic discrepancy in student aptitude. Teaching here is not easy, but the staff is ready to go six days a week. The students are curious, intelligent, aspirational, and loving. They are a tight-knit group—older students look out for the younger ones, they share everything, and while there are arguments, they’re only short-lived. They’re great kids on their way to becoming great adults. J&J’s students come from the most disadvantaged communities in Karupadanna and the surrounding areas. They come almost exclusively from the 25% of families in this area who live below the poverty line, subsisting on less than $70 a month, ie $2.33 a day. They are all first-generation learners, the first in their families to read and write. Some students here face food insecurity, while others face housing insecurity, and some face both. Some students have been physically abused others are pulled out of school to help harvest crops, to save money of their parents or to work to support their family, missing school. J&J is a school made out of passion of its founder to give education for children in his locality. All its funding comes from his own hardwork, and now he finds it difficult to do any more investment as he does not have any other business as a source of income. 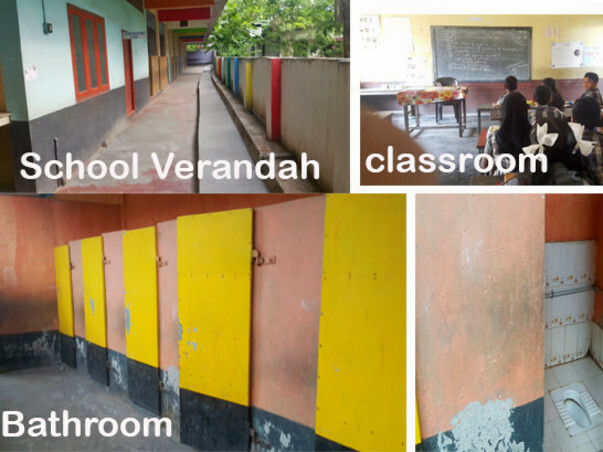 Furthermore, the school takes in less money than it might due to Mr. Veeran’s admirable decision to take only $9 per month because it would be too costly for many students. This school is weathered from insufficient funds to invest anymore. Key pieces of infrastructure are worn down or missing altogether. There are no proper toilet facilities or libraries for the students. Mr.Veeran does not have enough funds to appoint any more teaching staffs as he could not bear their salary from the very less fees obtained from students, that too many fees being pending for a couple of years. J&J is lucky because it has all the things that money can’t buy—a strong chairman, caring staff, and teachers that love. However, J&J is in dire need of some infrastructural upgrades, and that is why I’m reaching out to you all for help. I sat down with Mr.Veeran and asked him to come up with a list of what he thought his school needed most. The list was a bit long, but he trimmed it to the most important items—a wish list that can be made a reality for just $78160. Below you can find the final list which includes creating a school library, upgrading the school’s bathrooms, and adding fans to classrooms. We aren’t talking about adding Smart Boards or fancy language software. Instead, we’re talking about essential and long overdue infrastructure that the school badly needs and that will immediately improve the quality of students’ lives and education. Infrastructure: As a teacher, I know how important it is for a student to learn in a proper classroom. Here classrooms do not have a tile or a sheet on the floor. They sit in a class which has floors chipped off. 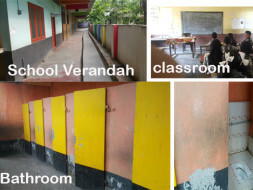 Painting: Students don’t have a classroom which is painted properly. This will affect their creativity while learning. Bathroom Improvements: The bathroom situation is a major problem. The stalls are nearly door less, leaving students with difficulties when they want to use the bathroom. There are pipes that constantly leaks creating a layer of dirty water those students must walk through to use the facilities. Depending on which way the wind is blowing, the smell of the bathroom can stink up the entire first floor. The bathroom has not been renovated in years, and it was never designed for the traffic that it gets now that the school has 500 students. Library: My students do not have access to books outside of their lesson books. They also do not have a quiet place to study or think. A library has been a dream of us, but due to funding constraints, we are never been able to get it off the ground. We’ve created an outline of the library’s layout. A great library will make a huge difference in the educational lives of our students. Waste Bins: There are no garbage bins in our school premises which mean trash is either left on ground, on the walkway or tossed out classroom windows. Waste bins in premises would keep the school cleaner and help students get in a good habit of depositing their trash properly. CLASSROOM: Flooring is very important for the classrooms. Students become dusty from the dirt and dust on the floor. I cannot explain how much it would mean to the school if we can raise this money—not just to get these major improvements done, but because it will show everyone at my school that people all over the world are rooting for them. Please, even if it is five dollars, consider donating to help a wonderful community and improve the educational experience of some fantastic kids. As a teacher in J&J I would be grateful if we could raise at least a portion of the amount and bring some changes. All views and opinions expressed in this post are my own and do not represent any NGO, Community, Management, State etc. A word about accountability—anyone that donates will receive a document with every receipt for every dollar spent. Corruption is very real in India, and I want everyone who donates to know that your money went directly to the improvements listed above. Not even a Dollar from the amount raised will go for any personal benefits or for any other requirements which are not stated above. The above fundraise is only for the betterment of children in a small area of Kerala. Anybody who donates even a 1 Dollar is most welcome to visit our school and spend your time here in this area whenever you visit Kerala. Just send a mail to sunithahabeeb7@gmail.com regarding your date and time of visit. For any clarifications or further knowledge about this fundraiser programme, feel free to give a call to 0091 8139092771. Anybody who wishes to sponsor any specific requirement given above can also contact in the same contact number given above.